I'm not in the mood to blog in detail so just thought I'll post up some photos. They are not very well taken because there's just too much stuff. Pardon please. Did this haul last month, splurging part of my ang pow money. I bought a lot of lip glosses. Wasn't in a good mood then. I'm sooo happy I finally feel so much happier this week. Really thank you to those who helped me take a whole load off my mind. Appreciate it. And of course my lovely trusted spree organizer for this haul. Most are from E.L.F 50% sale. 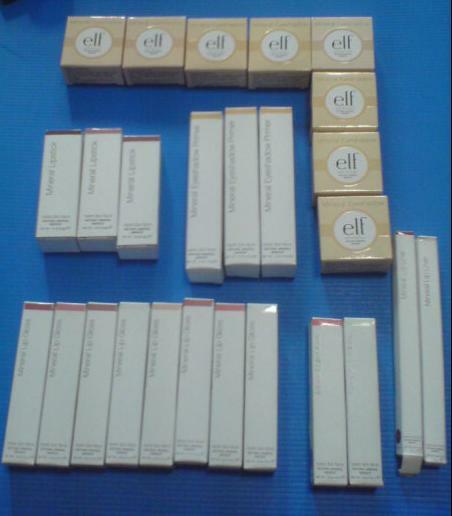 I think I have enough E.L.F to last me a few years. 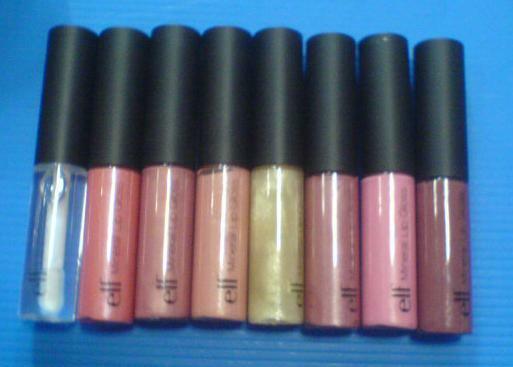 The lovely E.L.F Mineral Lip Glosses that I've been eyeing for the longest time. So pretty, isn't it? 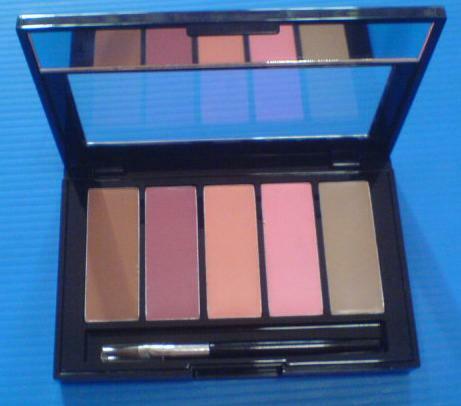 They have been compared to MAC lip glazes by other reviewers. Since I've not tried MAC lip stuff, I'm not commenting on that. But these glosses are definitely worth getting. Pigmented and super chic and cheap. Probably the best lip gloss among all the lip glosses in E.L.F. (I've quite a few from different ranges). All items from E.L.F Mineral line. 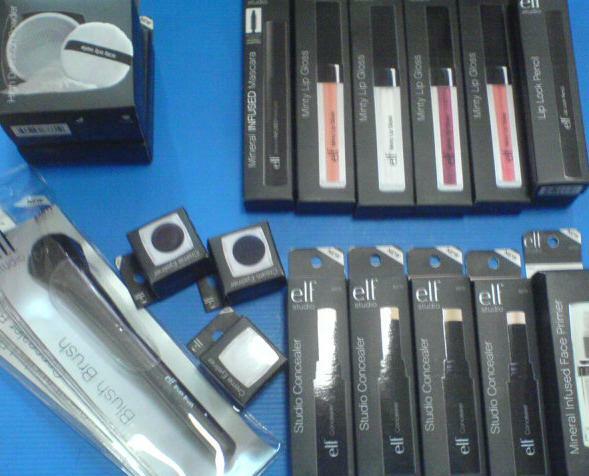 Eyeshadows, lipsticks, eye primer, whole set of lip glosses, lip liners. The mineral eye primer is indeed worth the rave. All items from E.L.F Studio line. Bought backups of brushes that I like. HD powder, Mineral Infused Mascara, Minty Lip glosses (So heavenly. I like to put them on whenever I feel sleepy), Lip lock pencil (it's lip primer before putting lipstick. Still trying it out), Cream eye liners (I don't find them pigmented enough. Works but not super impressed. ), concealers (I'm such a concealer fanatic. Since creamy concealers are hard to find, I like to buy up them in several shades so I can mix ) and face primer. The eyeshadow base in skintone and the lip gloss palette in "The Nudes". The lip palette is really pretty and so far I'm really liking it. I don't really like lip glosses in makeup palettes because it's just so inconvenient to dig in and it's just disgusting if it's next to the eyeshadows. But I really like this palette. The glosses are really creamy and it's so easy to mix your own lip gloss shade to your liking. Would suggest to invest in a better lip brush because the one in it is just crappy.